Gardens Penthouse Hok is a vacation apartment that epitomizes contemporary tropical design. Efficiently using available space, interiors are appointed with a variety of beautifully crafted and complementary woven, along with finely finished, wood furnishings, pieces and fixtures. Amenities are discriminatingly five star – to ensure all-out guest delight and diversion. Built on a hillside ascending from Kata Noi Beach, Garden Penthouse Hok truly affords you upland living with a stylish ambience. The apartment has two bedrooms. Both have dedicated bathrooms with rain showers. One of these bathrooms, however, also has a bathtub. All rooms of the apartment open out to a furnished balcony with magnificent views. At the edge of the apartment’s exterior view deck is a plunge pool. 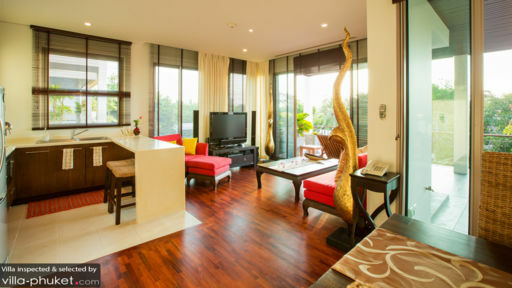 Immerse yourself in its glassy waters and recline as you gaze out to the Andaman Sea. 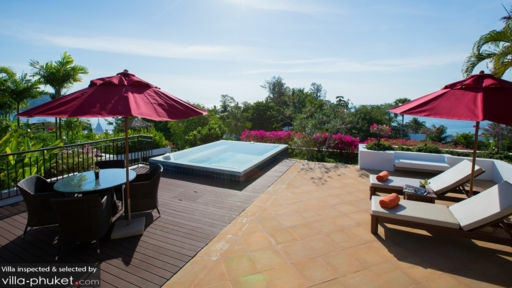 For some sun, you can lie on cushioned, wooden pool beds partially covered by a large umbrella on the stone deck. In one of the apartment’s breezy rooms – just by the entrance – is the living area. On its long sofa facing a widescreen TV, you can all converge to catch the shows you’ve been closely following. Or, to watch, once again, your all-time favorite classic film. By the room’s alternative entrance is the indoor dining area with its wooden table that accommodates four. An alfresco dining area -- with a glass-topped, woven wood table that seats four – is fixed on the wooden deck adjoining the plunge pool. At any of these dining areas, you can all have your fill of delectable specialties which you all took turns cooking at the fully-equipped and modern kitchen section alongside the living area. The kitchen also has a counter which, provided with stools, can double as a bar. In charge of carrying out your requests for rentals as well as for organizing day tours is the apartment manager. 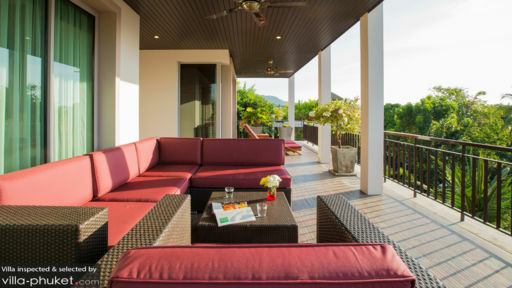 Gardens Penthouse Hok is located in Kata Village. Just a short walk from the apartment are the white sand shores of Kata and Kata Noi – famous among families for their picturesque seascapes. Must-try dining places along Kata South – one area of the beach – are Capannina, Boathouse and Villa Royale. Water fun doesn’t stop with swimming and surfing. There’s more in store at the man-made Surf House Phuket. You will also be exhilarated at the Dino Theme Park with its mini golf course set in pre-historic times. Other must-sees are the Karon View Point and the Kata Temple. You mustn’t, as well, miss out on the dazzling night life at Kata Center.